Ever since The Flash returned from its midseason hiatus, the Scarlet Speedster and the team at S.T.A.R. Labs have made it their mission to prevent Iris West from being brutally murdered by Savitar in the near future. In fact, they’ve gone to such lengths as having Cisco vibe Barry Allen to that exact moment in order to study the situation, or even the latter travelling all the way to 2024 in an attempt to uncover the big bad’s true identity. Well, a photo taken from the set has surfaced that not only hints that Iris’ death will be averted, but that someone else may end up taking the proverbial bullet. 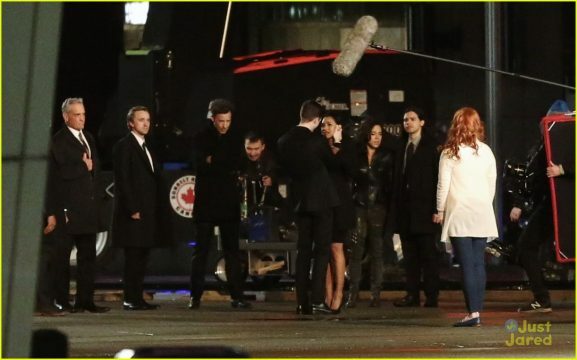 As we can see, pretty much every member of the principal cast is dressed to mourn, with one noticeable exception: Danielle Panabaker’s Caitlin Snow. Let it be known that Jesse L. Martin was spotted on set, so he’s being ruled out as to whom may be biting the dust. Furthermore, it’s quite interesting to see that both Gypsy and Jay Garrick managed to show up, so I guess the latter may end up being freed from the Speed Force much sooner than expected. If Caitlin is indeed killed off, it’d impact the show greatly. Sure, it’ll survive, but you have to admit it’s hard to see someone who’s been around since the pilot episode go. Perhaps the producers thought they painted themselves into a corner creatively and couldn’t do much more with the Killer Frost character, especially since they explored that persona with the Earth-2 version last season. And should her hypothetical death be that of a hero’s, it would serve as a nod to her comic book counterpart, who has since taken a heroic turn of her own and joined the Justice League of America. To be honest, I was half-expecting the show to take this version of Caitlin in a similar direction, but I guess we’ll just have to keep watching in order to find out what happens for certain. Still, let’s not rule out Panabaker herself coming back down the line, because there are likely other versions of her character in the multiverse to be utilized. Just ask Tom Cavanagh. The Flash returns with new episodes on Tuesday, April 25 on The CW.